This month, there is a rather long list of professional development for October 2017 at the end of this post. Before I get to the professional development, I want to spend some time writing about 2D printers. 2D printers are often touted for their ability to create exquisite handmade decorations, for scrapbooking, and making cards. But for educators, they offer much more. 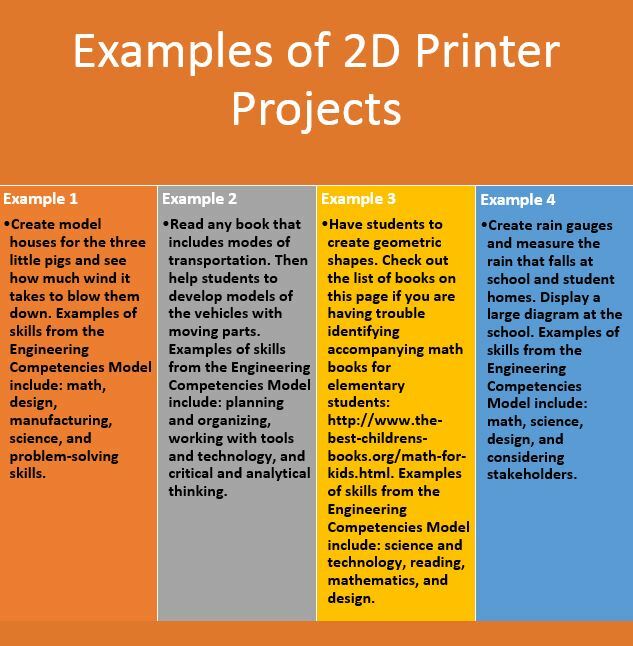 If you can’t afford a 3D printer, you can still introduce your students to STEAM concepts with digital fabrication. The price point is much cheaper than a 3D printer. They can be purchased for $250 and below. 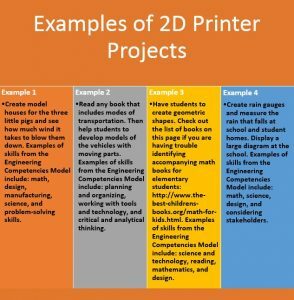 In addition, if you are new to digital fabrication or concerned about students in lower grade levels annihilating a 3D printer, you can start slow with a 2D printer. 2D printers offer a great opportunity for collecting data for 3D printer grants while stepping into the world of digital fabrication. The American Association of Engineering Societies (AAES), in collaboration with the U. S. Department of Labor (USDOL), developed the Engineering Competencies Model (AAES & USDOL, 2017). The model has five tiers. Within these tiers, there are several competencies that school librarians address. Incorporating a 2D or 3D printer into our activities, strengthens the ability of students to conceptualize what it means to be an engineer and practice real-world skills that are crucial for completing degrees and assuming positions as engineers. If students are not exposed to role models that use STEAM career skills, they are less likely to pursue these careers. Thinking about practical ways to incorporate skills from the Engineering Competencies Model has the potential to change the lives of students. Moreover, the skills in the model are easy to implement in the library. For example, Tier 1 addresses “Personal Effectiveness Competencies” such as lifelong learning. Tier 2 relates to “Academic Competencies” that include reading, mathematics, and science and technology skills. Tier 3 is for “Workplace Competencies” and relates to skills such as planning and organizing, creative thinking, problem solving, and decision making. Tier 4 is for “Industry-Wide Technical Competencies” and incorporates design, manufacturing, and construction skills. These competencies link to the current AASL (2007) Standards for 21st-Century Learners. For example, the standards state that, “Reading is a foundational skill for learning, personal growth, and enjoyment. The degree to which students can read and understand text in all formats (e.g., picture, video, print) and all contexts is a key indicator of success in school and in life” (AASL 2007, p. 2) While school technologists teach many of the same skills seen in the Engineering Competencies Model (AAES & USDOL, 2017), the Technological Pedagogical and Content Knowledge (TPACK) framework indicates that content should drive instruction and technology should support that content. In describing TPACK Mishra and Koehler (2006, p. 1029) assert that, “Quality teaching requires developing a nuanced understanding of the complex relationships between technology, content, and pedagogy, and using this understanding to develop appropriate, context-specific strategies and representations.” Hence, a school technologist is not likely to focus on standards developed for and by school librarians. We teach within our context, support the entire school curriculum, and have the potential to reach all of the students in a school. We are in a remarkable position to impact how students view and pursue STEM careers. I can imagine that you are wondering about some of the things that you can do with a 2D printer. I will share a few below. Remember, that students can work in teams and complete research projects for any of my examples. This helps students to develop their interpersonal skills. In addition, it is important to collaborate with teachers to see what is going on in their classrooms. Then you will be able to identify projects that support the curriculum. If you have successfully used 2D printers in the past for STEAM activities, please share your wisdom and results in the comments section. I look forward to your comments. As always, the professional development is shared below. American Association of Engineering Societies & the U.S. Department of Labor. 2017. Engineering competency model. http://www.aaes.org/model. American Association of School Librarians. 2007. Standards for the 21st Century Learner. http://www.ala.org/aasl/standards/learning. Mishra, P., and M.J. Koehler. 2006. “Technological Pedagogical Content Knowledge: A Framework for Teacher Knowledge.” Teachers College Record, 108(6): 1017–1054. Silhouette America. 2017. Silhouette ModelMaker. http://blog.silhouetteamerica.com/2017/02/silhouette-modelmaker. Description: Join Booklist for this free, one-hour webinar that will explore new ideas for addressing common problems in makerspace. If you’re growing restless with kids who putter but don’t seem to finish, or if you’re looking to make stronger curriculum connections in your makerspace, consider layering the design thinking process to your program. First designed for use in advertising and product design, design thinking is a problem-solving process that prioritizes empathy, research, testing, and iterating. It keeps the student work open-ended, which is critical to maker mindset, while providing a thinking framework that can have powerful impact on how students interact with their world. Design thinking can be used with a wide variety of tools and media, including sewing, cardboard construction, coding, video game design, engineering, and more. In this webinar, we’ll examine the design-thinking process and share some strategies, supports, and starter ideas to get you going. Led by Kristin Fontichiaro, Clinical Associate Professor, University of Michigan School of Information and Series Editor, Cherry Lake Publishing. Moderated by Booklist Books for Youth senior editor, Sarah Hunter. Description: Have you ever considered shifting to personalized learning for your early learners, but weren’t sure the best ways to go about it? Do you want to keep play alive and well, while maintaining high expectations and academic performance? Join Dr. Courtney L. Teague as she covers some great instructional strategies, along with apps and tools that will help transform your teaching and young learners. Come learn how you can use personalized learning to engage and inspire your future-ready learners! Description: Join this session to discuss diverse learners in K-12 schools. Listen as the speaker, Kwame Simmons, CEO of Simmons Advantage, discusses how many students face academic and personal challenges that become roadblocks to achieving their diploma. Mr. Simmons will discuss how credit recovery is an effective way for many students to overcome those obstacles. Unlike other credit recovery courses, Fuel Education has built courses from the ground up to support learners who may need additional motivation and remediation. We have created a motivational, self-paced learning environment with embedded social-emotional learning support, and growth-mindset approach to help students reframe their struggles as opportunities for future success. Register today to hear more about why FuelEd’s credit recovery courses and social-emotional learners. Description: Achieving College and Career Readiness for students of cultural diversity, linguistic diversity, and poverty presents numerous, oft-times seemingly insurmountable challenges. In schools where heterogeneity underscores the gaps, brain-shaming adds an additional burden for students at-risk. Equal access is not always equitable. Blended and personalized learning provides the ideal toolset for improving literacy outcomes through a data-driven, culturally appropriate RtI (Response To Intervention) implementation. Description: Breakout EDU Digital is the online version of the immersive learning games platform. It’s exciting! It’s fun! And it’s an effective learner-centered teaching strategy you will reach for again and again. Learn how to implement this instructional strategy in your classroom. Understand the many benefits of this approach such as developing problem-solving skills, fostering a growth mindset, encouraging collaboration and teamwork, and promoting access to content knowledge. Description: As our library clientele becomes more diverse, so must our programming. The good news is that you already have the skills and access to the resources you need to research, plan, and deliver targeted programming in languages other than English. In this webinar, we’ll focus on how to adapt your current storytimes for Spanish/English storytimes. You can use this same process to deliver storytimes in any language. Description: Most students love to text message – maybe too much. While many teachers see this as a distraction, why not use this familiar and appealing tool to engage your students? Join Jerry Swiatek as he discusses why text messaging can be a powerful tool for instruction and how you can use it in your classroom. He will also share classroom examples and various resources that can be used with text messaging. Title: Using Your iPad to Make Movies on the Go! Description: Have iPad, will travel! With the addition of the camera to the iPad2 and now the 5MP camera on the iPad3, users have more of an opportunity to make movies on the go. This webinar will cover various video apps and discuss ways in which they can be used at school. Join Tia Simmons as she explores how teachers and administrators can easily incorporate movies for a multitude of purposes, including making introductions or sharing good things. She will also discuss how students can produce videos on a variety of subjects to display mastery of a skill or at the culmination of a unit. Description: Are you looking for ideas that can help your students improve their understanding of concepts and support skills that are crucial for their success in a global society? Digital storytelling with mobile devices and applications can help your students develop and enhance creativity, information fluency, communication, and collaboration skills. Join Jenna Linskens for a fast-paced webinar in which she covers 15 free digital storytelling apps shares examples of how they can be used in the classroom. She will include effective uses, engaging applications, and creative ways to develop digital stories. Description: How do we transform the “tuned out” student to a “turned on” learner? In this edWebinar, Kevin Baird, Chairman of the Board at the nonprofit Center for College & Career Readiness, reviews best practice research and draws from real-life success stories of classrooms that changed to engage. Attendees will learn how classroom design can directly impact student engagement. Description: Want to go paperless? Looking for a way to revolutionize your teaching and learning? Experience the power of Microsoft’s FREE OneNote! Microsoft OneNote is a free tool that takes digital notebooks to the extreme while keeping everything together on all of your devices. Organize, create, and collaborate anytime anywhere with text, audio, video, files, digital ink, and so much more! Provide student support, feedback, and encouragement from one simple application. Description: Are you looking for new picture books to offer at your storytimes? Storytimes are one of the most popular and consistent library programs held for families, yet we often feature the “tried and true” books we have used for years. This webinar will focus on new picture books that will engage the storytime audience, including books that invite audience participation, books the promote the five parent practices (talking, singing, writing, playing, and reading), books based on songs and nursery rhymes, books that promote preliteracy skills and kindergarten readiness, and websites useful to storytime planning. Description: Would you like to help your students to become more proficient, lifelong readers and writers? A balanced literacy approach helps students move toward independence as readers and writers through a gradual release model. In this session, Dr. Jayme Linton will provide an overview of the eight components of balanced literacy and share strategies that you can use to implement a balanced literacy approach in your own classroom. Join us to learn how to help your students become more independent readers and writers. Description: News literacy is a hot topic in the national media, not just in education. The lexicon is changing. Popular news outlets now routinely use phrases such as “different narrative,” “right version,” “fake news,” “alternative facts,” and “wrong information” to describe one another’s reporting. Six in ten Americans get their news from social media, and according to UNESCO’s Five Laws of Media and Information Literacy, that is not a bad thing so long as news consumers are equipped to read intelligently: with skepticism and empathy. In this edWebinar, Michelle Luhtala, Library Department Chair at New Canaan (CT) High School, will share close reading exercises and activities for learners in grades 6-12. Description: Have you ever had difficulty dealing with parent or caregivers? It can be very hard for some parents and caregivers to communicate with schools for a variety of reasons. It is also be just as difficult for teachers to communicate with some families, especially if family dynamics and behaviors are challenging. As a result, some children and teens end up struggling throughout their school years because of the strained communication between the adults in their lives. Join Tamara Hill, a licensed and trauma certified child and adolescent therapist, as she discusses aggressive and challenging families and suggests ways in which schools and teachers can effectively manage and deal with them. Description: Social media has the potential to increase community engagement with new and existing library patrons. Join us to learn how libraries can effectively use social media tools, even with limited staff and time. Learn how to identify the appropriate social media platforms to market library services and events, and how to integrate best social media practices in your library’s marketing plan. We’ll help you build a foundation for your social media strategy and provide practical ideas and tactics for immediate use in your library. Description: Teachers are presented with a challenge each year: how do you balance being strict enough to command respect with being personable enough to build positive relationships with students? Join veteran teacher and administrator Shannon Holden as he shows novice teachers how to establish themselves as the authority figure in the classroom. Description: The way that we learn is as different as our DNA, which makes educating a classroom of thirty students very difficult. If you are using Google Apps for Education (GAFE), then you likely know the power of Apps, Add-ons, and Extensions; however, are you using these free tools to strategically address the needs of all students? Join Matt Bergman as he shares with you strategies to address the needs of all learners as he explores GAFE through a UDL lens. Participants will learn how to use a variety of Google Apps, Add-ons, and Extensions to meet the needs of all students in their classroom. Description: Would you like to easily connect, collaborate, and communicate with other educators, parents, or classrooms- whether they’re next door or around the world? This webinar will show how you can easily connect and collaborate with the free video chat resource, Google Hangouts. Join Nikki Robertson as she shares how you can use Google Hangouts to conduct parent-teacher conferences, collaborate with other teachers, or chat with other classrooms. You will also learn how students can work on collaborative projects with students in other parts of your state, country, or the world. Description: Travel the world with the new Google Earth web. Learn about Voyager guided tours and more! Dust off your digital passport and join us on a journey using the new Google Earth web. Learn the key features of Google Earth web and how to incorporate this powerful tool into your classroom instruction. The reimagined version of Google Earth includes features that go beyond the use of maps and satellite imagery. Users can now explore the world with Voyager, Google’s Earth’s showcase of guided tours, and try out the 3D button to view places from any angle. Leave with classroom ideas and lesson planning resources. This session is for teachers at ALL technology comfort levels. Daniella Smith, PhD. is a former school and public librarian. She is currently an associate professor at the University of North Texas. Gallery Walk, A Novel Idea!